E ARE SITTING at an outdoors cafe: five or six chairs scattered on the bank of a small river and further down, under a plane tree, a cabin covered with vines, and a sign that reads “The educated Spider.” We are drinking our ouzo watching the trouts leap in pairs out of the water, which foams like a white garland around their shiny heads. We enjoy the serene beauty of the scenery without uttering a single word. Only a few minutes pass by and three loud explosions one after the other make the glasses on the tables shake and deafen me. I snap out of my reverie leaping from the chair. Far away, in a farm, the sound of glass windows breaking is heard; voices and swearing idealised by the distance disturb the silence for a while. Then silence again. The others around me – local men – remain calm, as if they heard nothing at all, and they continue to sip their ouzo, wiping the drops lingering on their mustaches with their hands. Above their hair fly big evening mosquitoes. I can’t sit quiet and turn to the one sitting next to me. He is wearing purple robes. Then, seeing that the bird calmed down and stopped popping in and out of his sleeve, he stands up and beckons me to follow him. The others don’t even notice us. We go past the backyard of the cafe, through a fence covered with vegetable marrows full of orange flowers, in the size of big brass trumpets, and we enter a vast field with many basins. You can hear animals snorting. We go from basin to basin. They are all deep and waterless, and brown cows are gadding on their bottom. They stoop every once in a while above the manger and start masticating. Their bellies are enormous and they pop out of their bodies perfectly round and swollen. “Look carefully at those over there, now that they are fanning their tail to drive flies away,” my companion tells me. I look and see a big white bung shoved well inside their asses. Straps tied under their legs and bellies and tightened around their back, hold the bung in place, making it impossible for the animal to get rid of it. “And the animals never relieve themselves?” I ask, looking at the cows with pity, while they are picking with their huge lips some long weeds growing in patches on the wall of the basin. At that very moment, we heard footsteps. Two unshaved men with dirty short aprons hanging above their knees, are approaching the basin. 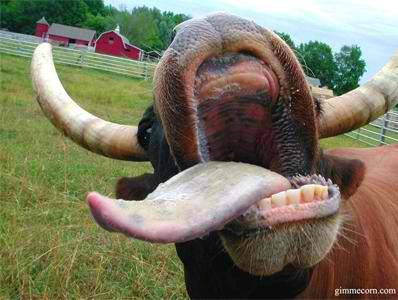 They are cowmen. We quickly hide behind the terrace. The cowmen climb down the steps and enter the basin. One of them, holding a measuring tape, goes from cow to cow and measures the perimeter of their belly. The other one, in the dim light of a lantern, scribbles the measurements in a notepad. When they finished measuring, the cowmen climbed up and headed to another basin. Then, we come out of our hiding place and return following the same road with our heads full of thoughts but remaining speechless. At the very edge of the field, there shines a windowless hut, made of tin cans. Instead of a door, there is a round opening. Two more cowmen, with the same unshaved faces, but wearing aprons that reach down their heels, bend over a long wooden bench, where pieces of bloody skin are spread. They clean them up with big knives. We tiptoe away like ghosts. Crossing the edge of the field, I am beginning to see the river again. Big leaves travel slowly on the water. In the engulfing silence, we hear only the mosquitoes’ wings and our steps that crack twigs and branches as we walk. Source: From the short story collection The Cows, “Texts”. 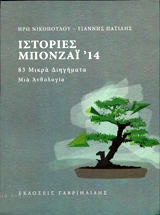 Athens 1980, 1st edition. Proti Ili editions, Athens, November 1963. E.H. Gonatas (Athens 1924-2006). He studied Law and he is a poet and essay writer of the post war generation. He was mainly known as “a writer of the paradox.” He made his first appearance in Greek letters with the short story, titled “The traveller” (1945). His last book was the Three nickels (short stories, Stigmi editions, 2006). In 1994 he received the National Translation Prize. Vassilis Manoussakis (Athens, 1972). Poet, short-story writer, translator. He studied English Language and Literature. He currently teaches at the University of Peloponnese in Kalamata.